Thanks Gillian from the tip about the Kooks. Saw their set last night at the Kool Haus, really impressed with their songs. It was the first time in a long time I walked out of that venue without complaining about the sound in there…. I’ve been tapping my right foot and Zellers flip-flop to this band all day. They’re a four-piece band from Brighton (UK) who take their name from an old David Bowie song. 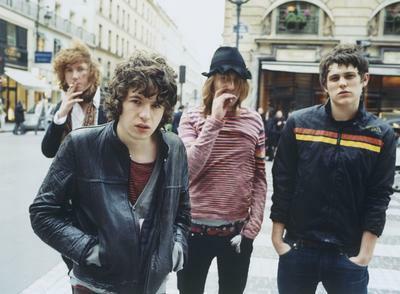 The band has set records for UK/NME hype, finishing 2nd to the Arctic Monkeys for most debut records sold (Inside In/Inside out, 2006). In most cases, bands never live up to NME hype, in this case, I’d say these guys will have a lot of luck touring and selling records in North America. Take a listen to their biggest single Naive. More tracks can be found on their myspace page. Could this be a band added to the Virgin Fest? As well, I found a video here for another one of their really catchy songs called Ooh La. (And of course, a cover of that song that some people liked last year or something…). These videos, courtesy of La Blogotheque. Do yourself a favour, check out their videos. Amazing.